LOCUST swarms destroy crops and threaten the livelihood of millions. The problem is more severe in Asia and Africa because locusts, which belong to grasshopper family Acrididae, breed easily in warm, moist conditions, assemble in massive groups, eat more and cover vast areas. According to a new study, the microsporidian gut parasite, Paranosema locustae, can be used to check the swarming behaviour of migr atory locusts and control locust plagues. Researchers found that the parasite causes hindgut acidity and controls the locust’s immune response, which suppresses growth of the hindgut bacteria. These bacteria are behind the production of the aggregation pheromone (che m icals released in the locust’s faecal pellets which encourage swarming beha v iour in other locusts). Reduction in hindgut bacteria and the consequent reduction in the aggregation pherom one cause a drop in serotonin and dopamine levels__the neurotransmitters which initiate and maintain swarm behaviour. The experiments were conducted by exposing uninfected locusts to glass chambers containing faecal volatile chemicals from both healthy locusts and locusts infected with Paranosema. 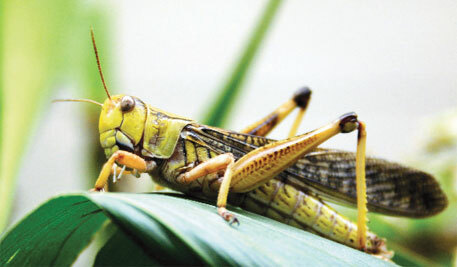 The locusts aggregated more and displayed a higher antennal response to uninfected faeces compared to infected faeces. The research was led by Wangpeng Shi from the department of entomology, China Agricultural University, Beijing, and published in the January 14 issue of Proceedings of the National Academy of Sciences.